Edited by I. O. Evans F.R.G.S. I. O. Evans (Idrisyn Oliver Evans) love of science fiction and Jules Verne led him to envisage a series of Jules Verne books where he could re-introduce to the public the many works that were not commonly known. It was the publisher Bernard Hanison (a 29 year old) who signed a contract with I. O. Evans in 1958 for such a series. The address of the offices of Bernard Hanison was 10 Fitzroy Street, and hence the name of the series, Fitzroy Edition. Yes, you are right. "The Fitzroy Edition" was named after the street where my offices were, 10 Fitzroy Street. I had purchased the lease of 10 Fitzroy Street in 1952 for the remaining period of 20 odd years for a small amount, and £700 per year rent without any rent reviews. It turned out to be a great bargain and in 1962 when I sold the property to property developers made more money than I ever made in publishing. Somewhere there is a moral,but I cannot find it. Fitzroy Street was, or still is, a very famous street in central London in the heart of Bloomsbury. My own building was used in the 1920s and 1930s as the meeting place of the "Fitzroy Group" group of English artists, and many famous people had lived there. It was demolished in 1962 or 3 with all the attatched magnificant buildings tgo make way for a new office block which is now the offices of one of the famous advertising agents. Some original buildings still remain, however, especially in Fitzroy Square (London, W1), that is adjacent. Bernard Hanison published under his own name Bernard Hanison, London and also under ARCO Publications Ltd., London. After signing the contract with I. O Evans, Bernard, in 1959, sold the companies and the works to be published to MacGibbon and Kee. It was MacGibbon and Kee who continued to publish the Fitzroy Edition under the ARCO Publications banner. Any books in the works at the time could still be published but recognition to the publishing entity Bernard Hanison had to be given. ARCO went on to publish 63 different titles in the Fitzroy Edition. The intention of this new edition of one of the greatest of imaginative writers is to make it as comprehensive as possible, and to include his lesser-known, as well as his most popular works. 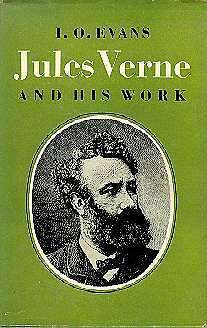 Jules Verne is universally acclaimed as the founder of modern science fiction and as the author of a number of exciting stories of travel and adventure, but he also produced several historical novels and some acute studies of contemporary life. 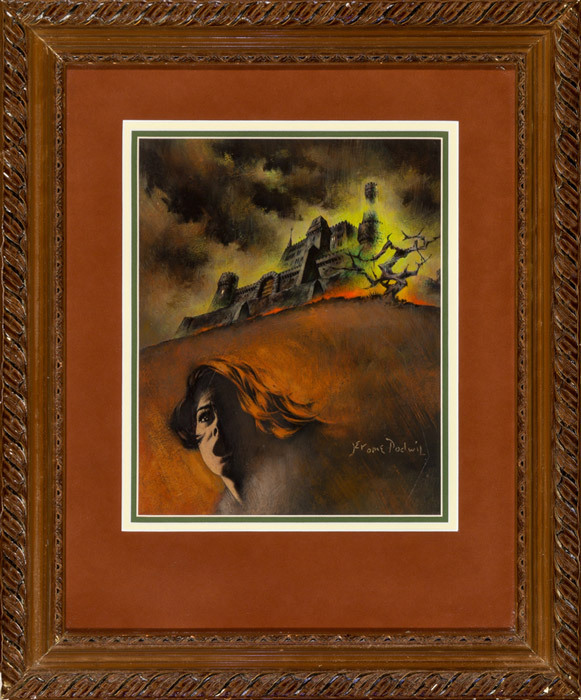 The first three books in the series are selected to illustrate several aspects of his work. A Floating City is based on his own experiences when he crossed the Atlantic in the ill-fated Great Eastern, a vessel that was intended to be the greatest achievement of nineteenth-century engineering but which proved to be its greatest failure. The Begum's Fortune, a remarkable work of science fiction, displays its author's gift of foresight, for it contains not only what is probably the first idea of an artificial satellite but a grim foreboding of the modern totalitarian state. Finally, Five Weeks in a Balloon demanded inclusion, for it was through this book that Verne won his success as a writer. The series is under the general editorship of I. O. Evans, F.R.G.S., compiler of Jules Verne: Master of Science Fiction, and for many years an admirer of Verne and a science fiction addict. In the days of science fiction the old masters are not necessarily outworn; their prescience and vitality remain something to wonder at, even if their world is old-fashioned. The major works of Jules Verne have never been dropped; witness the fabulous success of Round the World in Eighty Days...The volumes in the Fitzroy Edition by I. O. Evans, give in somewhat abbreviated form some of the lesser known novels which I found most entertaining. With his tremendous knowledge and industry, Verne filled pages with detail which is here pruned away to give a quicker narrative. 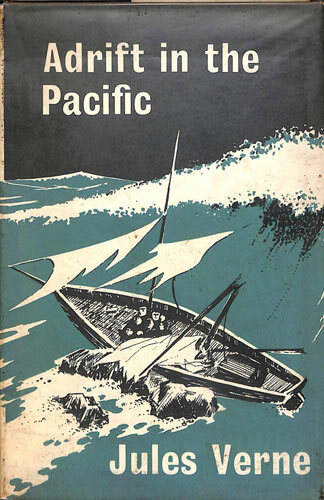 The books in the Fitzroy Edition edited by I. O. Evans, were published in London by ARCO Publications and in Westport, Connecticut by Associated Booksellers in the late 50s and early 60s. The first volumes of the series were published by Bernard Hanison, London. Selected titles were reproduced by MacGibbon & Kee and Granada. Finally in the 1980's and onwards, Amereon Ltd (or Amereon Household Ltd) began publishing the titles. Some of the titles in the series were translated by I. O. Evans, while others were simply editted (and abridged!). There was a requirement by the publishers to have each book in the series be a certain length, approximately 190 pp. Because of this, I. O. Evans did 2 different things. He abridged the stories, so that they would be the required length, and he also broke longer books up into 2 parts, so that the parts would be the required length. It is because of this "break-up" of books, and the different titles assigned to each half of a book, that has caused some confusion among readers and collectors as to what book is being read. It can be quite difficult to match up a Fitzroy title with the original Jules Verne title! This list clarifies what the original title of each book was, by using "aka" (also known as), and by using "pt 1: ..." and "pt 2: ..." where necessary. There are 63 titles in the complete Fitzroy Edition series. 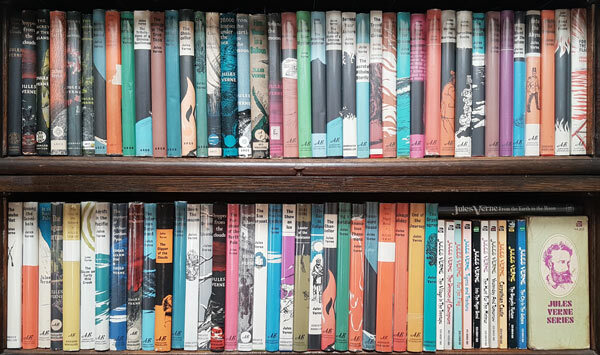 These are the Hardcover books, with Dustjackets, published by Bernard Hanison (London), ARCO (London), & Associated Booksellers (Westport, Connecticut). There are also 10 titles duplicated in the paperback Fitzroy Edition series. These are the paperback books published by ACE, New York. The image of Jules Verne on the cover of these books is by Ron Miller. 1963 oil on board 13.75 x 10.5 in........................1965 Oil on canvas 17 x 15.5 in. The book contains an Acknowledgement, Preface and 26 page introduction by I. O. Evans, followed by excerpts from Jules Vernes works. The book ends with a bibliography by Kenneth Allott. Each excerpt is prefaced and concluded by a note from I. O. Evans. Though Jules Verne is rightly honoured as a pioneer of science fiction, his reputation now rests almost exclusively on a few of his best-known works. 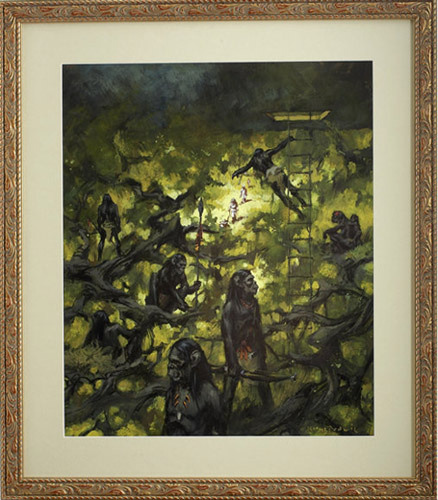 While these certainly rank among the classics of the art, they form only a small portion of his tremendous output. Many of his books are noteworthy for their striking and original themes, including intimations of the helicopter, guided missles, and an artifical satellite! No selection from his work could omit his descriptions of the balloon Victoria and the submarine Nautilus, of the Columbiad space-gun and its projectile, or of the perils awaiting the explorers of the extinct Icelandic volcano. Other lesser-known passages are also included here, notably his helicopter Albatross, his mechanical elephant, his artificial island, his immense cavern immediately below Loch Katrine, and his enigmatic Sphinx-like rock dominating the South Pole. The compiler, who has long been a voracious reader of science fiction and is a life-long admirer of Verne, summarises the Master's work in his Introduction and discusses it critically. My thanks are due to Messrs. Sampson Low, Marston & Co. Ltd. for permission to quote so freely from their editions of Jules Verne's works, from which the great majority of the extracts are taken. The exceptions are the extracts from Five Weeks in a Balloon, A Journey into the Interior of the Earth, and Twenty Thousand Leagues Under the Sea, for which I am indebted respectively to Messrs. Routledge & Kegan Paul Ltd., Messrs Ward Lock & Co. Ltd., and Messrs. William Collins, Sons & Co. Ltd.
My thanks are also due for permission to quote shorter passages: from Boys Will be Boys to Mr. E. SA. Turner and Messrs. Michael Joseph Ltd.; from the introduction to his Scientific Romances to the executrix of the late Mr. H. G. Wells; from Miss Clemence Dane's broadcast to Miss Dane herself and to the British Broadcasting Corporation and to Messrs. The Cresset Press for permission to use the exhaustive and definitive bibliography compiled by Mr. Kenneth Allott and published in his book. I am, moreover, indebted to the librarians and staffs of the Wandsworth, Westminster and Croydon Public Libraries for their co-operation in placing at my disposal the volumes from which I have quoted. Finally, my thanks are abundantly due to Mr. Allott himself and to Madame Allotte de la Fuye for the two sources of information on Jules Verne's personal life as well as on his work; and to my Wife for invaluable help not only in the detailed work of preparing the manuscript but in selecting passages likely to be of greatest interest........I. O. E.
My introduction to Jules Verne occurred in my childhood, when a Journey to the Centre of the Earth was the only readable story in the highly specialized library of a village Sunday school. later I progressed to Round the Moon, Twenty Thousand Leagues Under the Sea, and other Verne masterpieces, as well as to H. G. Wells and Edgar Allan Poe. This juvenile reading had far-reaching effects on my life. It was through interests that began in my early acquaintance with Verne that I have become a "Science-fiction addict", an amateur speleologist, a student of geology, and a Fellow of the Royal Geographical Society. 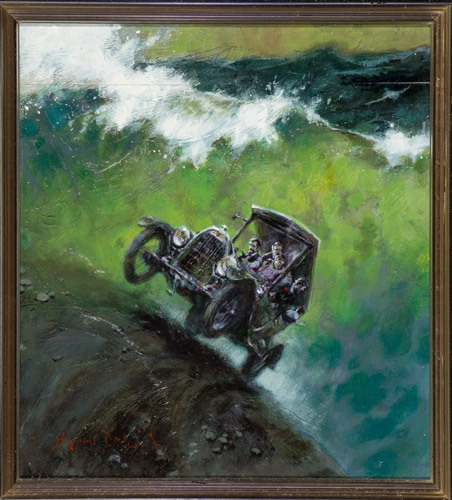 His influence, too, has greatly affected my own literary work, for my historical stories for juvenile reading, in which appears a strong science-fictional interest, could, I am informed, be aptly described as "Henty crossed by Jules Verne". I first learned of the so-called "pulp magazines" of the scientifiction school from my friend Mr. A. C. Garrad; in these I found, along with much "space opera", and abundance of really good work. And here, as in the later developments of science-fiction, so ably summarised by Miss Clemence Dane in her broadcast talk, I have been interested to trace the influence, along with that of Poe and Wells, of its pioneer and master, Jules Verne. 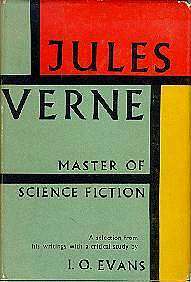 In spite of many recent developments, both in science-fiction and in the science on which it is based, several of Verne's works still live, not merely as classics of the art-form but as being as readable as ever: A Journey into the Interior of the Earth, the moon-voyage stories, and Twenty Thousand Leagues Under the Sea (as well as Round the World in Eighty Days, which is not science-fiction and so is not represented in this collection). The bulk of his work has, however, largely dropped into oblibion, and this includes much that well repays reading. Not all of it was science-fictional; indeed, its greater part consists of "straight" adventure stories of exploration or travel from which strange inventions and gadgets are completely absent. Nor, indeed, are all his science-fiction stories included here; there are no quotations, for example, from The Purchase of the North Pole, or Master of the World. To my great regret I have been unable to quote from Verne's latest books, for these appear unobtainable, either in translation or in the original, and for this reason I could not, as I hoped, include the very last of his works, The Eternal Adam. None the less the present selection will, I hope, be enough to show the breadth of his interests, the originality and versatility of his mind, his mastery of an adventurous sweep of narrative, and his powers of description. Except for a few minor alterations, of obvious copying errors or incorrect punctuation, I have adhered to the original translations, for the form in which Verne reached the English speaking world is part of his literary history. Verne brought me much delight in a childhood that was not over-happy, has given me a wide variety of interests, and has been a source of pleasure time and again. If, by reviving interest in his lesser-known works, I can communicate any of that delight to others I shall be glad indeed........ I. O. E. ...I seek to discuss his stories just sufficiently to enable the reader to decide which of them is likely to enjoy, and to warn him off those which might disappoint him, for it cannot be denied that Verne over-wrote himself and produced some inferior stuff. I have tried to make the treatment I give each book roughly in proportion to its merits; where I deal with it at length the reader might wish to read it for himself, but where I dismiss it in a few sentences, he might, with a few exceptions, prefer to do the same....I. O. E.